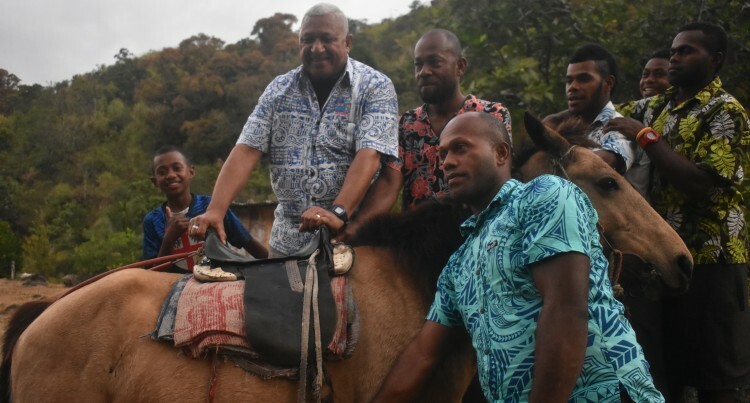 Prime Minister Voreqe Bainimarama yesterday visited Sauvakarua Village to experience first-hand the struggles villagers there endured on a daily basis. The village is located deep within the mountain ranges of Navatusila District in the province of Navosa. Mr Bainimarama and his team of Government officials crossed rivers and rough terrain to reach out to villagers. Villagers travel by carrier for more than five hours from Nadi through Nausori Highlands and walk another hour to reach Sauvakarua Village. “Sometimes people living in urban areas don’t understand the struggles that people in isolated remote areas go through on a daily basis,” Mr Bainimarama said. Ten years ago, he said, he was informed about the struggles people of Navatusila District endured daily, which led to road upgrades and other infrastructure development. Mr Bainimarama also discussed the need to construct a kindergarten for the village to prevent children from travelling far, taking into consideration its geographical location. He then approved the issuing of carrier licences by the Land Transport Authority to allow three vehicles in the village to transport students daily to their respective schools. Village headman Filipe Roko said they were blessed to have Mr Bainimarama at their village where they were able to raise their issues of concern. “Instead of us going down to them, Mr Bainimarama came up to us with his Government officials so that we could tell him the struggles we are going through,” he added. Meanwhile, plans have been made by the Water Authority of Fiji to install more water pipes in the village soon.